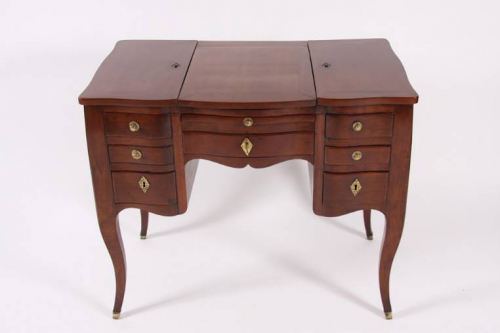 A beautiful mahogany dressing table with cabriolle legs, a serpentine front and brass sabots by Paris furniture maker Balthazar Coulon. The mirror closes down and slides along so it can be positioned anywhere along the depth of the top. The two top sides are lockable cabinets that open out. Also features a pull out writing panel on the front.